You won’t find a “K” or a “P” in the name of Brenda Watts, who owns and runs K&P Flying Service in Watson, Arkansas. Watts doesn’t mind explaining, though, and the story reveals not only her determination and business skills, but also her love of agriculture and ag aviation. The “P” stands for Phil, her first husband, who farmed in the area. Marrying him was Watts’ introduction to farming and living in the country, both of which she found she loved. The “K” stands for Kelly, her son, who got the flying bug while growing up on the farm and working as a flagger for ag applicators. He earned his private license, learned to fly a small plane, then went to flight school to become a commercial ag pilot. The family bought an Air Tractor 602 plane and started an application service. Kelly was the pilot and Brenda ran the office, kept the books, talked to customers, studied airplane mechanics and crop protection products, and did the scheduling and dispatching. Eventually, though, the couple’s marriage ended and then their son left the business. “I said to myself, ‘I can do this,’” Watts recalls. While she didn’t fly the plane, she had become highly knowledgeable about the business and its customers. She picked up the pieces and took ownership of K&P in 1999, after the owner of the Air Tractor dealership agreed to co-sign for financing. Watts has made the business a success, and now jokes that K&P has come to stand for Knowledge and Precision. She gives a lot of credit to her pilot, Don Glasscock, who’s been with K&P for 14 years. She also has a good, reliable ground crew employee, Patrick Hickey. Her “can-do” attitude extends beyond the business, too. Years ago she got involved in the Arkansas Agricultural Aviation Association, eventually becoming the group’s president. She’s also a member of the National Agricultural Aviation Association and became its treasurer in 2013. “At the time, I thought that was the only office I’d be offered there,” she says. NAAA leadership thought differently. She declined their offer to be president in 2015, thinking of the time and travel demands of the position. But they asked again for the 2016 term and she reconsidered. Before she agreed, though, she had to talk to some people — first her husband, Rick, and Glasscock. They both supported her. She became the group’s first female president. As the year was wrapping up, Watts had traveled to 21 states—some more than once—Washington, D.C., four times, and Montreal. Her term as president coincided with NAAA’s 50th anniversary. “I loved it,” she says of her very busy year. Watts had gone through the yearlong Syngenta/NAAA Leadership Training Program in 2008, and says it has helped her communicate better and manage her business more efficiently, which proved especially valuable in 2016. 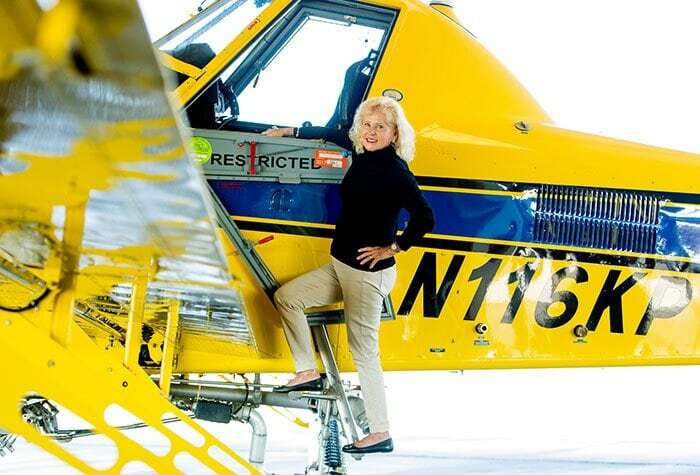 She’s passionate about issues affecting ag aviation, especially safety. Wind turbine towers are a new hazard for ag pilots in some rural areas, and NAAA has just gotten legislation passed requiring them to be marked with lights. Aircraft maintenance is vital, too, and Watts has her plane serviced at or before the recommended intervals. Southeastern Arkansas is a good market for aerial application. Most fields have been laser-leveled for efficient irrigation of rice, and farmers also grow soybeans, corn, cotton, sorghum and wheat. The application season starts at the end of January with burndown herbicides and runs into late October. What’s next for Watts? She served NAAA in 2017 as past president, and will now continue on the Executive Board for another five years. She looks forward to having more time for K&P, which has just taken delivery of a brand new Air Tractor, and for the farming operation she also runs in Watson. She and her husband have their private pilot’s licenses and enjoy flying their single-engine Cessna.